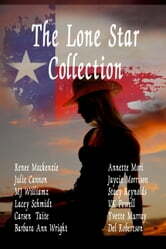 In this wonderful collection of 12 stories, there is something for everyone- romance, erotica, humor, sci-fi, and historical fiction, all within a Texan theme. Celebrating the 10th anniversary of the Lonestar Festival, a free to enter one day event celebrating Lesbian literature and the authors who write in the genre. Held in Austin Texas, all funds raised will be used to fund future events. Contributing authors: Julie Cannon, Renee MacKenzie, Annette Mori, Jaycie Morrison, Yvette Murray, VK Powell, Stacy Reynolds, Del Robertson, Lacey Schmidt, Carsen Taite, MJ Williamz, Barbara Ann Wright.